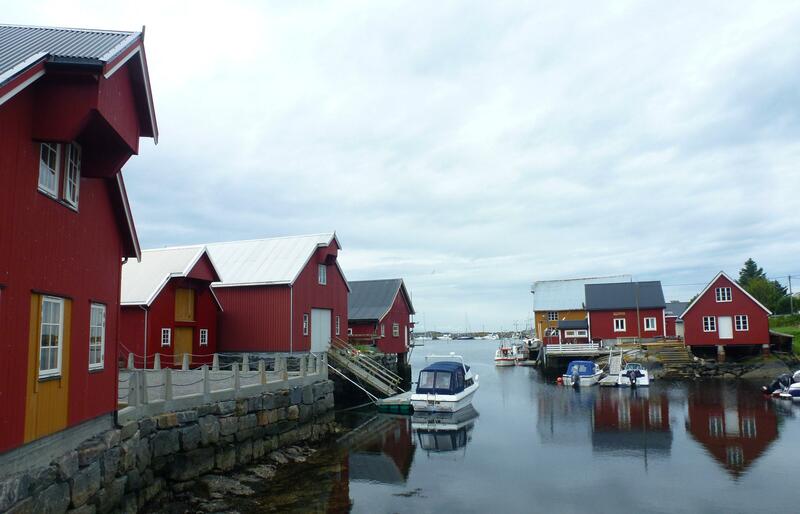 Following our very touristy few days we took off away from the main attractions onto some of the fjords and islands on the West Coast. A couple of ferries, a few bridges and some very quiet roads and we found ourselves well off the holiday routes on the island of Ertvagsoya. We had no reason to head there other than we saw it on the map and decided to have a look. Linked on both hips to other islands by bridges it seemed more of a transit point down to the ferry points, especially now the toll of the main road has been removed. Mile after mile of fjords, forests and not much else. The odd small village tucked in here and there but even those didn’t really seem too worried about tourism – no souvenir shops, no ice-cream sellers, no cafes. 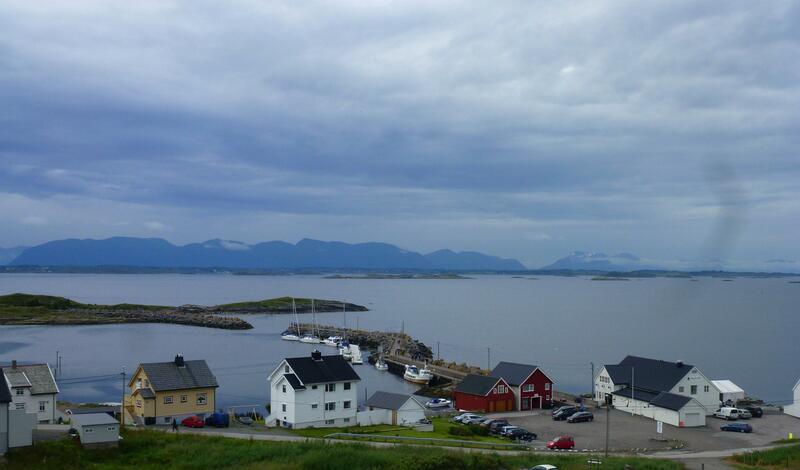 People seem quite happy to just wander around and look at the views – not hard to see why. 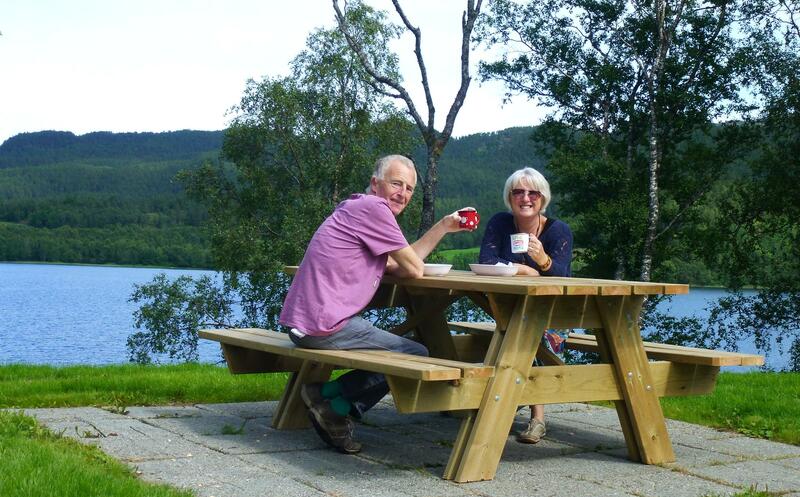 As with everywhere in Scandinavia picnic spots abound, find a good view, a quiet corner and they put in tables, chairs, some good parking and even a bbq, we have found a couple where even charcoal has been left by the previous incumbents for the next visitor. Despite it being peak summer holidays for the Norwegians as well as the most of the rest of Europe the roads are very quiet, nowhere seems overly busy. Whilst we have loved the scenery here without a doubt we have also been amazed at the sense of space – we looked it up to double check there really is that much more room here and there is. Norway has 14 people for every square metre of land, whereas in the UK we have 267 people for every square metre – amazing – oh and we feel very justified in not visiting Monaco as they have 19,183 people per sqm, they must have to stand way too close to each other! We have used a few campsites and all have had plenty of pitches, parking hasn’t been a problem and we have yet to queue for a ferry rather than just be waved straight on. 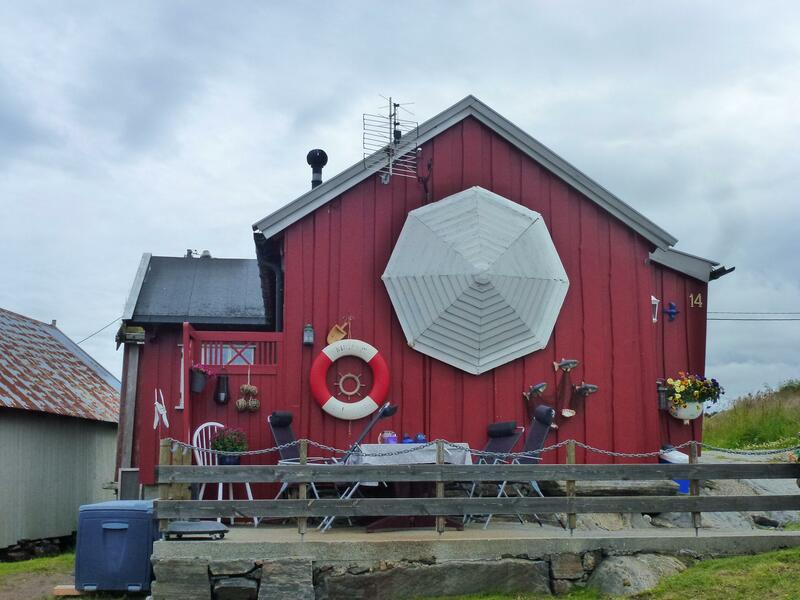 We expected the wild / free camping areas to be similar to those in Spain, bursting at the seams, but we have parked up for nights on stunning spots overlooking fjords and beaches and not had another vehicle join us on several occasions. Last night we tucked ourselves away on a marina, a Norwegian motorhome joined us, had their tea and then left, just us a few passing cruise ships and a couple of dolphins out in the fjord for the night. Not sure a spot like this would be empty anywhere else in Europe. The whole do we don’t we visit the Lofotons has been a major topic for the last few weeks. 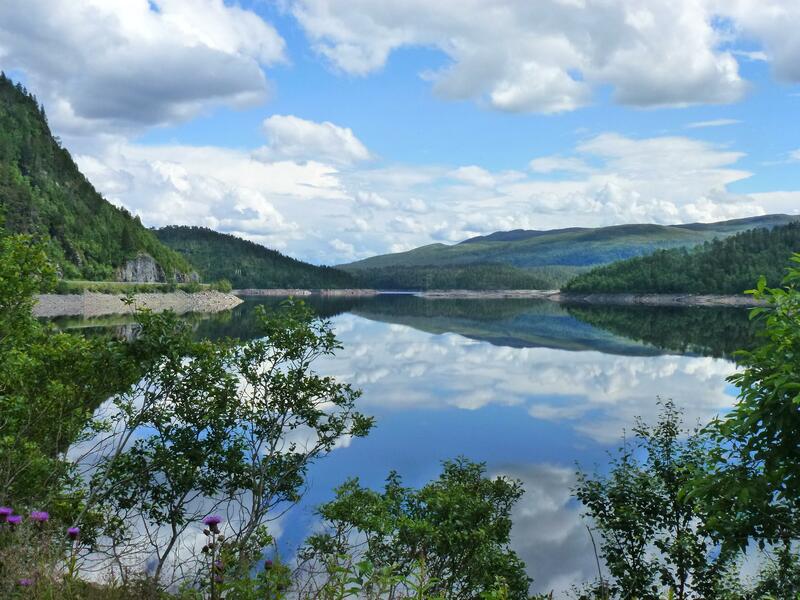 We are close in that we are in the same country and it seems a shame not to go, then we checked ‘close’ and found we are 715 miles away, and on Norwegian roads the driving time is estimated at 18 hours to get there. We both agree its too far and too rushed, hey ho will need to come back in a couple of years to see the Lofotons and Nordkapp. Instead we took to a few more of the back-roads, if the main tourist routes were quiet and the Western islands quieter then these were deserted. We drove around the coast and didn’t see more than a hand-full of vehicles in two or three hours. 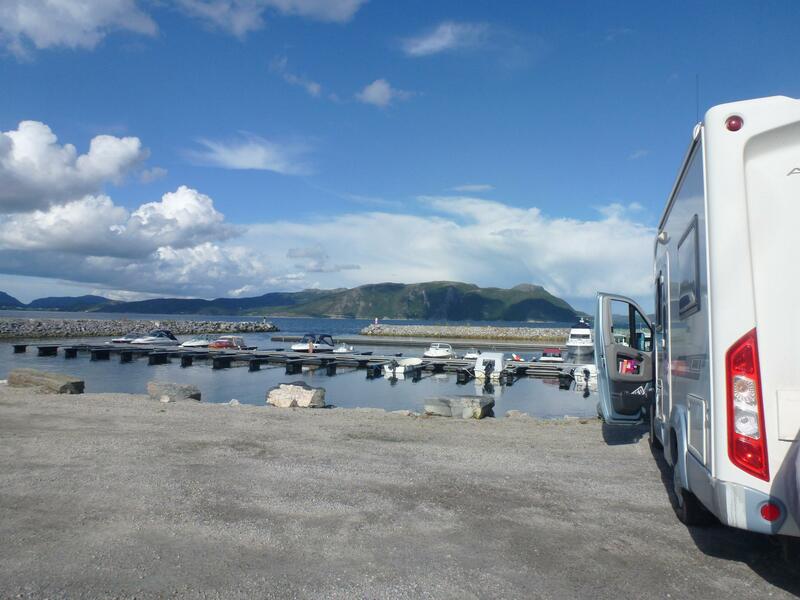 Our route North was capped at Trondheim, so we found a campsite next to the fjord and have sat out in the sunshine for our last few hours in Norway. The weather has turned from drizzle grey to “way too hot” and we have joined the mass ranks of the beetroot look-a-likes :). Tomorrow we turn around so our route South will be through Sweden, we have no fixed plans of what to see and do so will see what we find on route. Our first stop will be supermarket to stock up – the supplies have lasted well but we are looking forward to getting more than half a carrier bag full of fresh fruit and veg for less than the national debt of several small countries. 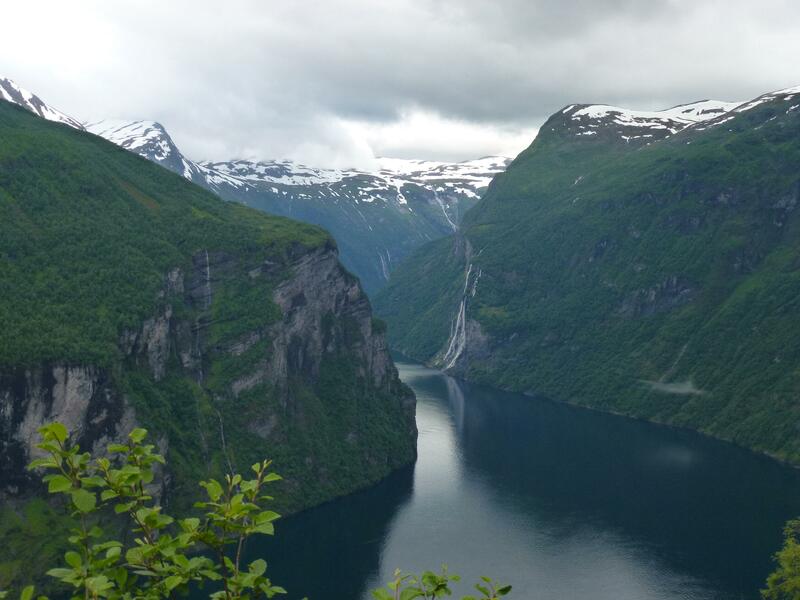 Two nights at Geirangerfjord was enough, we had done a month’s worth of washing, had a sit in the sun and watched the ships come and go, wandered round way too many souvenir shops and were both looking forward to somewhere a bit more peaceful and maybe seeing some trolls :). 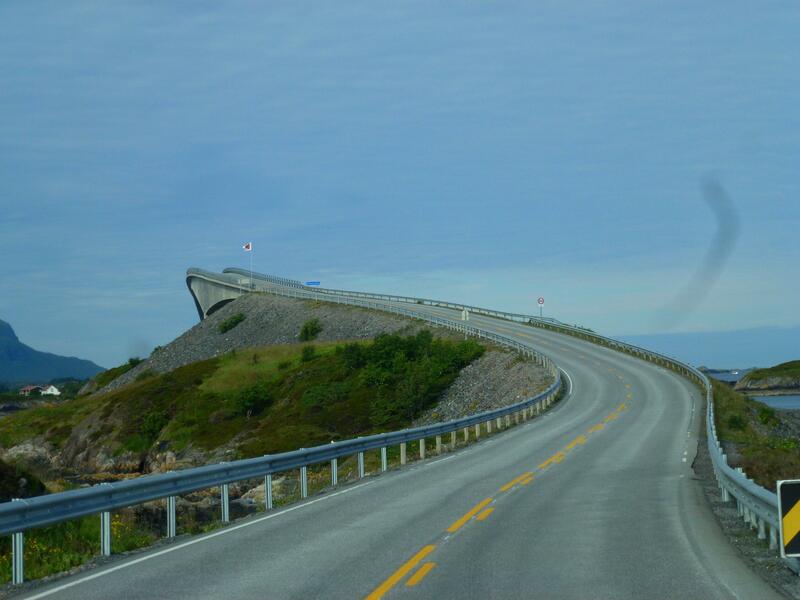 The route out of the fjord continued on Route 63, one of the tourist roads or ‘Veg’ as they call them. Pretty much as impressive as the road in, the Eagle’s Road has hairpin bends climbing steeply with not too much in the way of Armco, the worst bits were the dread of meeting a bus coming round the corner at the same time as us . Half way up there was a view point looking down the fjord, somewhere to stop for a photo whilst gathering nerves for the last few bends. It’s been surprising to us just how often the road stops and we have to take a ferry, if we had a proper road map this possibly wouldn’t be so surprising – however as we are still working with our trusty atlas the scale throws up a few surprises. We are the 6 metre length required for the lowest car charge and it’s cost us £8-£10 on most crossings. Eisdal was our only unlucky crossing where we were charged the next length (fairly as we have bikes on the back) and it doubled the cost to £20. 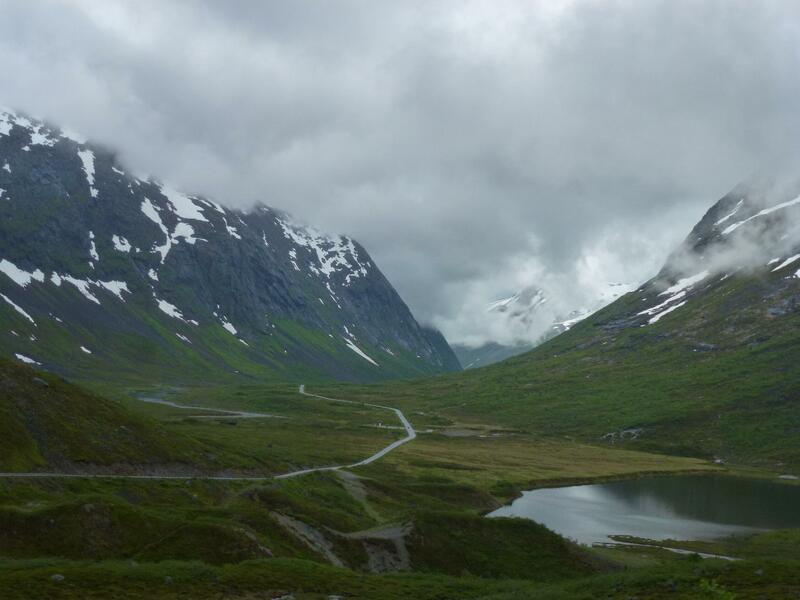 The weather was looking ok for driving the Trollstigen Pass, a bit overcast but no rain all day. As we pulled over the final brow to the visitor centre we hit a wall of cloud and fog, visibility was so poor that just parking up was testing. We walked to the view-point, we couldn’t even see the a few feet ahead of us let along the famous pass, a series of harpin beds, 11 in all, that zig-zag up the side of the mountain to 825 metres above sea level in a 9% climb. It’s only open for 5 or 6 months of the year as snow closes the road from October through to early May. For us it was a must drive, we had missed driving the complete Transfagarasn in Romania due to snow, so we really wanted to do this one in reasonable weather so we could at least see it. 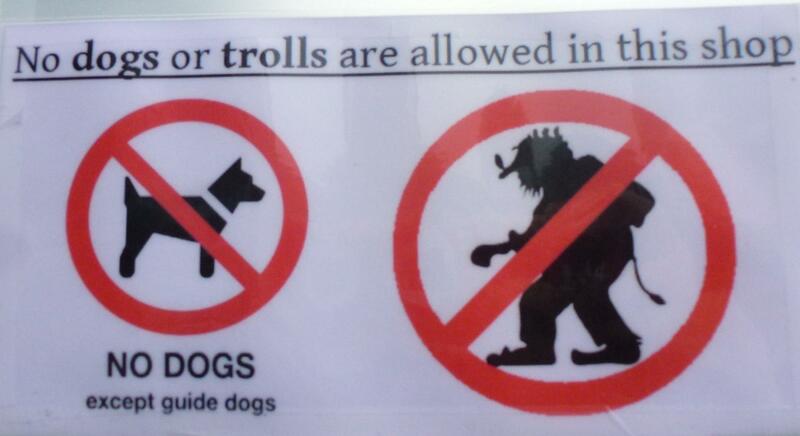 They must be real then!! Several hours later we were still sat there waiting for the cloud to lift, most of the tour buses and other tourists had gone down, the café and visitor centre had closed but at least 20 motorhomes were sitting it out with us overnight. Come the morning it was looking just as cloudy, we had breakfast and pottered around and then suddenly the cloud lifted. We shot along to the plateau viewpoint that looks down over the pass and our first view of Trollstigen – one of the most scenic drives in the world. There is a viewing platform at the top from which nearly the complete road can be seen, its looks great until you start spotting the vehicles trying to pass each other. Coaches crawling along allow motorhomes, cars and caravans to take the outside edges with absolutely no room for error. The longer we watched the worse my nerves become so of course Iain added to it by standing on the largest viewing platform that has a sheer drop of 200 metres, a glass fence oh and just a few holes in the steel floor so you can see the valley floor below. 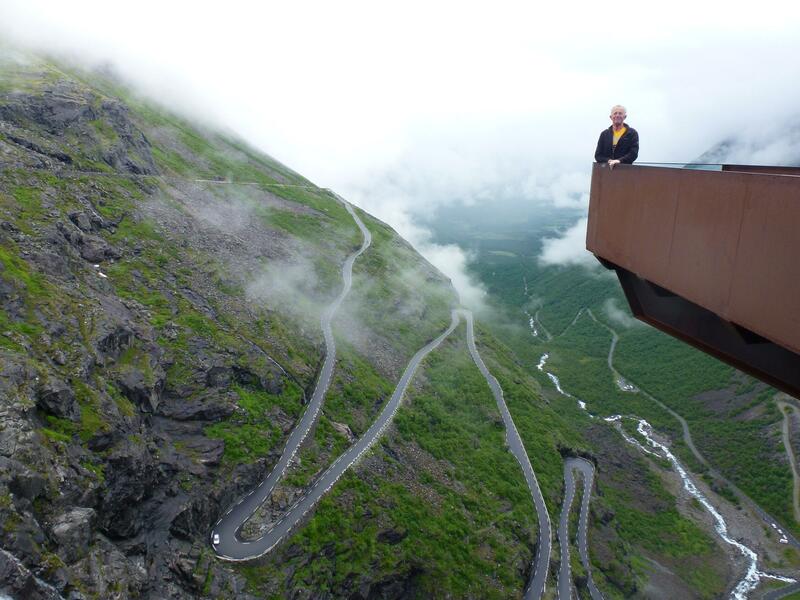 Suffice to say, we made it down, credit to mon chauffeur – he did great, not sure I did anything other than scream how close the edge was several times! 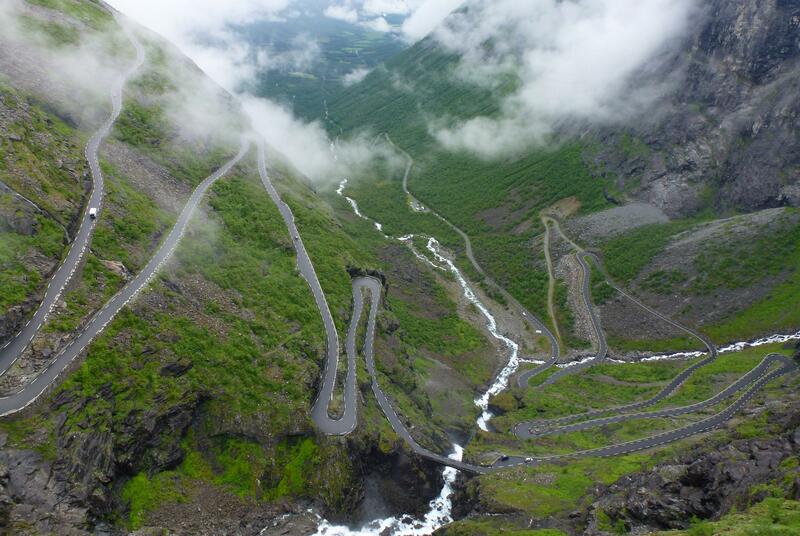 Once you are on the road (navigator view) it’s actually not as bad as some of the serpentine routes we have come across in Norway, the fact that 130,000 vehicles drive it every year means it seems better maintained and safer than some of the other mountain routes. 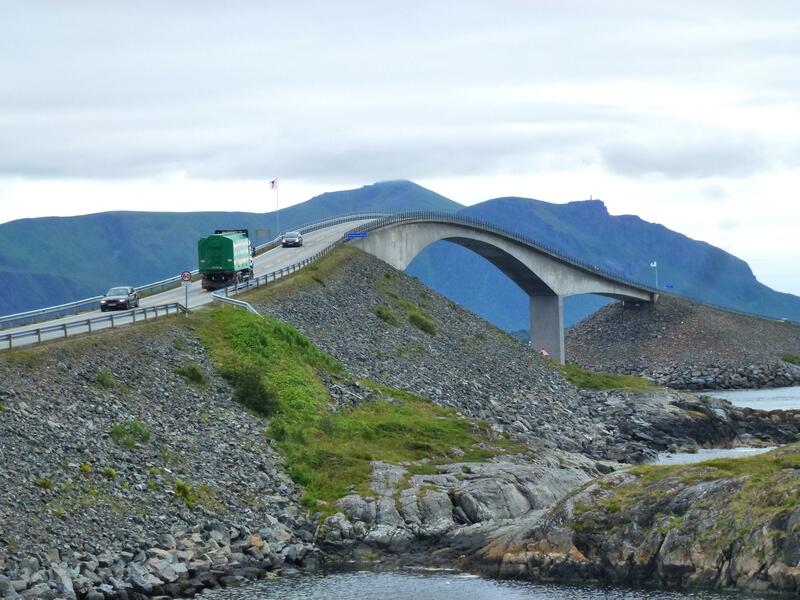 As we were in full tourist mode the next thing to do had to be to drive what the Norwegian tourist blurb calls ‘the most beautiful journey in the world’ the Atlantic Road. We had been debating whether to do this one as a few people had told us that many other roads were as good. But, being suckers for a well named road we just couldn’t resist. 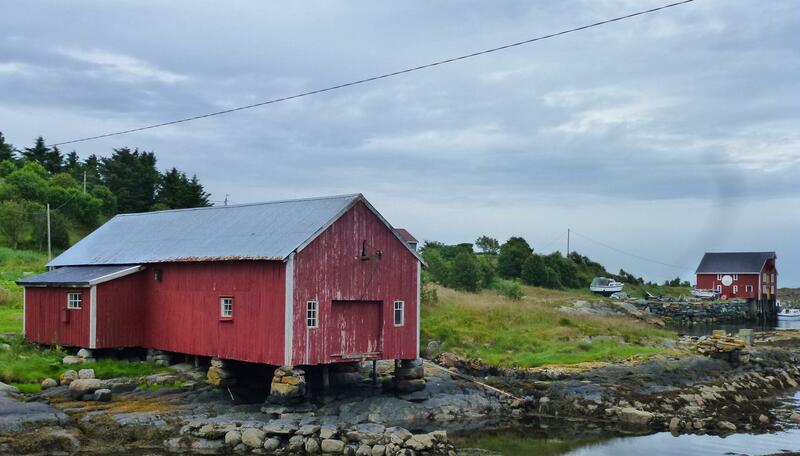 The route started in the old fishing town of Bud and followed the coast up through numerous small villages and hamlets, each one having the prerequisite small harbour, red wooden houses, thousands of tiny islands and views over the Atlantic. For us and probably for most that visit, the small section that actually traverses the Atlantic is the piece de resistance. 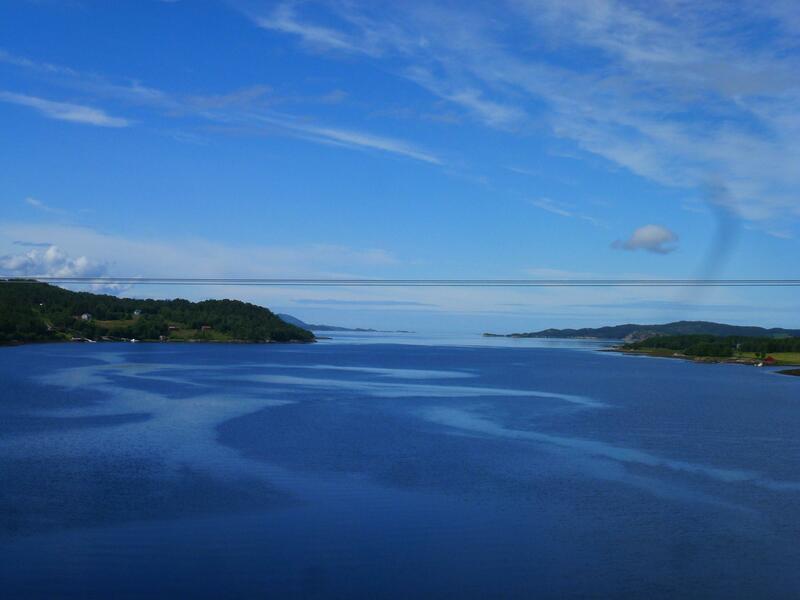 Eight bridges that come up one after the other in just over 800 metres linking small islets and skerries. 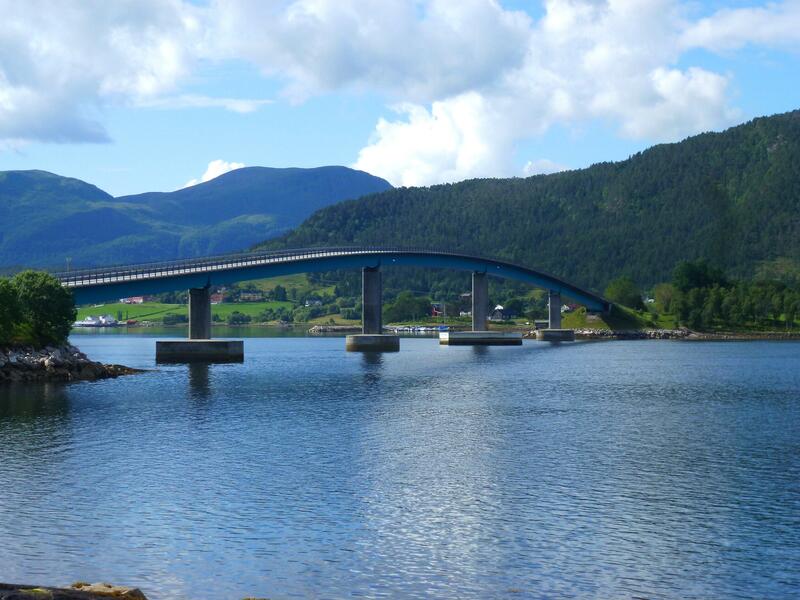 A breathe catching moment when the iconic Storeseisundet bridge comes into view, appearing to be twisting into the Atlantic. 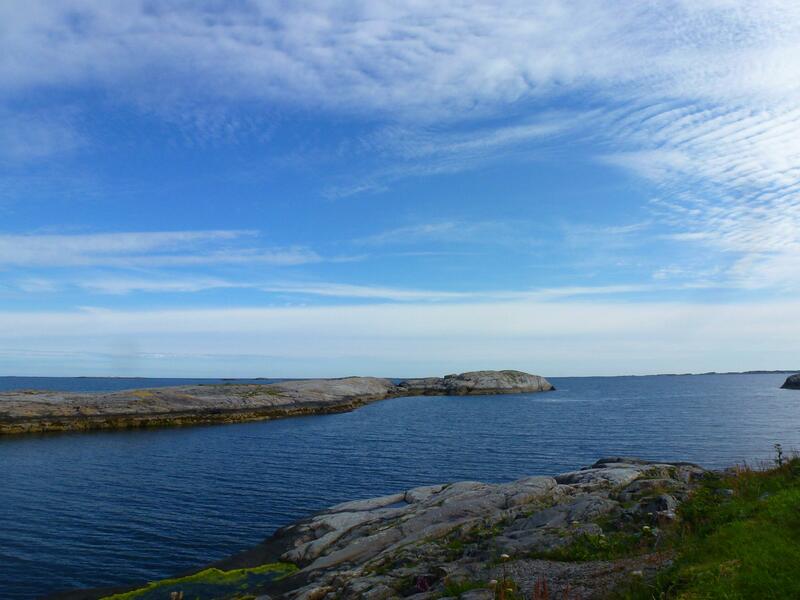 In the middle they have built a floating walkway around one of the small islands, view out over the Atlantic with a few small islets and then nothing much until Greenland. 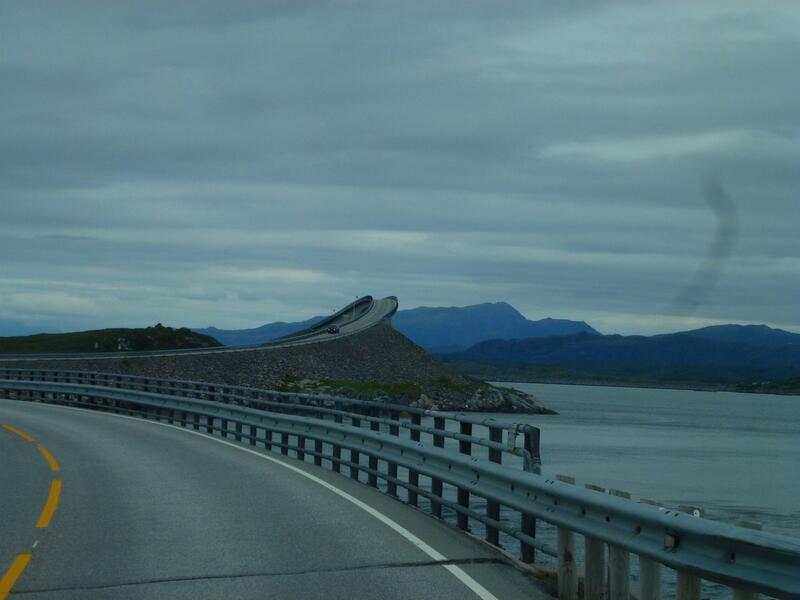 When we reached the end we took the advice of several who had been before and didn’t continue through the tunnel into Kristiansund, as if we didn’t make the cheap price it was going to cost us £40 to get there and then either the same to get back – or even more for a ferry. Instead we parked up on one of the many viewpoints along with plenty of other motorhomes and spent the evening looking at the Atlantic, end result was we then drive the whole thing again the next morning and it was more than worth it.